One of the best types of cooking vessels to have in your kitchen is a skillet made of cast iron. Buying a set of brand new and expensive non-stick pans is not necessary. The non-stick coatings on a lot of pans today is a non-healthy substance. This is the reason you should get rid of pans with any type of scratches. Cast iron skillets can stand up to more abuse than most products made today. Caring for cast iron skillets requires a little more work than conventional pans. You should not put cast iron pans in the dishwasher. This is a great way to ruin the pan. Pans that are made of cast iron may be washed in the sink to clean of any food residue. There are also a few other steps that are needed. If you are thinking of getting new cast iron skillets for use at home, then you will need to prepare them correctly. This is done by sealing or “seasoning” the pan. You will do this by adding a layer of lard or any vegetable oil to the pan and then bake it in the oven. Never use a scrub brush when washing cast iron skillets in your sink. All you should use is a cloth or a rag to clean the pan. Water is not beneficial to pans made of cast iron. You need to remove the water as any moisture will likely cause the cast iron to rust over time. 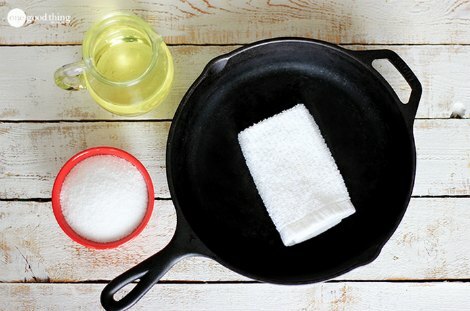 All your cast iron skillets need a layer of oil or fat after the water has been removed. This will keep all the pans protected. If you like to cook bacon at home, then save the bacon fat if no oil is available to use with your pans.